This irresistible updated BLT features peppered bacon, Neufchâtel cheese, sun-dried tomatoes, and arugula. Preheat the oven to 400 degrees F. Place 12 slices of bacon in a single layer on a parchment-lined sheet pan and bake about 20 minutes until crispy. Remove from heat and place on paper towels to remove excess fat. In a food processor, combine the Neufchâtel cheese, sun-dried tomatoes, garlic, mayonnaise, vinegar and basil and blend until smooth. Slice the tomatoes into 8 to 12 slices about 3⁄8 -inch thick. Lightly toast the bread and spread each slice with the cheese blend. 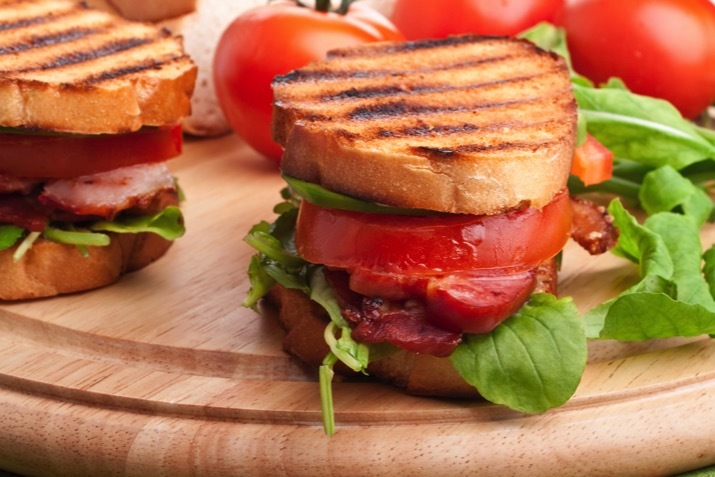 On four of the pieces of toasted bread, place 2 or 3 tomato slices, a small handful of arugula and 3 pieces of bacon. Top each with another slice of toast, cheese side down. Cut in half diagonally and serve. Add a fried egg or sliced avocado on top of the bacon for an outstanding breakfast sandwich, or try your favorite artisan bread, like roasted garlic or olive focaccia, instead of sourdough. Honey mustard potato salad makes a great side.